The increasing rate of rural neglect by the government in Nigeria has necessitated the embrace of self-help projects as a complementary development strategy for community development. 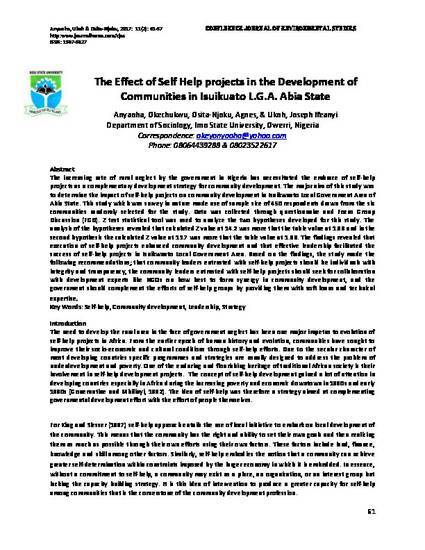 The major aim of this study was to determine the impact of self-help projects on community development in Isuikwuato Local Government Area of Abia State. This study which was survey in nature made use of sample size of 450 respondents drawn from the six communities randomly selected for the study. Data was collected through questionnaire and Focus Group Discussion (FGD). Z test statistical tool was used to analyze the two hypotheses developed for this study. The analysis of the hypotheses revealed that calculated Z value at 14.2 was more that the table value at 1.96 and in the second hypothesis the calculated Z value at 13.7 was more that the table value at 1.96. The findings revealed that execution of self-help projects enhanced community development and that effective leadership facilitated the success of self-help projects in Isuikwuato Local Government Area. Based on the findings, the study made the following recommendations; that community leaders entrusted with self-help projects should be individuals with integrity and transparency, the community leaders entrusted with self-help projects should seek for collaboration with development experts like NGOs on how best to form synergy in community development, and the government should complement the efforts of self-help groups by providing them with soft loans and technical expertise.